I love the honesty in your posts. Each day, I check to see if you have a new one up (no pressure!). My favorites are Saving Cinderella (I laughed and cried!) and This isn’t Alice in Wonderland (about your grandmother’s Alzheimer’s). Your stories on Alzheimer’s, Running, and Motherhood are lovely. I am very touched and honored by your words, Dawn! I love the creativity and fun in your writing exercises. I especially like the writing exercises featuring the characters in your book, which I am hooked on even though I’ve only been privileged to read bits and pieces. Brianna blogs about running, parenting and writing in a manner that is always engaging and vulnerable (which, lest you misunderstand, is by no means naive – for she is published and quite wise – rather to say charming and raw). You feel instantly like a long-lost friend who is privileged to know her thought processes and emotions, especially as they pertain to the very self-aware task of writing. Thank you, Alana! As Alana also shared in her Kudos Post,we were one of each other’s first followers. Before the challenge actually started, I saw ‘Writercize’ on the linky list and fell instantly in love with the name. I immediately clicked on it. After visiting Alana’s fun and smart blog, I also clicked on the follow button. I really enjoy writercizing! Kenda at The Caffeine Coquette honored me with this award because according to her the design is smooth and the content is rich. High praise indeed from a professional blog designer! Kenda has also given me an opportunity to post a monthly running article at The Caffeine Coquette. As I mentioned earlier, No Clever Craft is also a network writer. 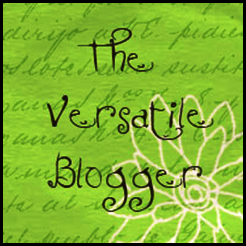 The Caffeine Coquette is a great resource blog for mothers and bloggers. 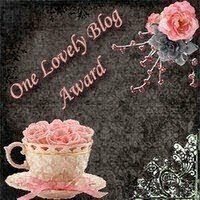 Thank you to Deirdra from A Storybook World for the Powerful Woman Writer Award. 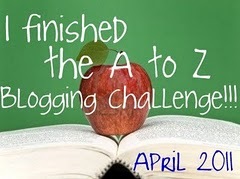 Deirdra did a wonderful job giving support to A-Z Challenge participants. 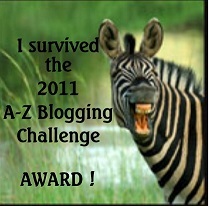 Elizabeth Mueller stopped by at the end of the A-Z Challenge with this award! How cool is that? I think it’s an awesome way to support the participants of the challenge and I admire her dedication!